Do you want to paint a picture? Sew your own wedding dress? Build your own prop or costume? Maybe fix a broken coffee table? 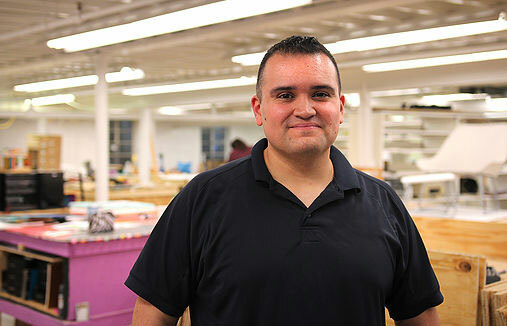 ​The Build Guild started as a space for individuals in the cosplay community to come together and create their costumes but our space quickly grew and attracted creative individuals across the artistic spectrum. ​We have the table space and an extensive selection of expensive tools and equipment to Do-It-Yourself all for as low $20 per month. We offer monthly workshops to teach skills or hobbies as well as a wall of “free stuff” to help you get started in your creative making process. Your creative journey begins here. We have tools, equipment, and table space for creative individuals to craft. We offer the option of dedicated locked tables and 24 hour access. Builders can take advantage of our “Free Stuff Bin”, full of materials donated by members that are free to use in any of your projects. We are open for tours Monday – Friday , 8:30am – 5:30pm. Ask to see the facility with one of the attendants at The Recovery Room (upstairs). Give us a call to ask general questions 260-341-3406. Here are just a few of our classes, check out our workshops page for more classes like Woodworking, Smelting, Welding Foamsmithing and much more!. 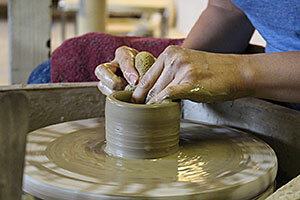 Learn the basics of throwing clay on a pottery wheel. 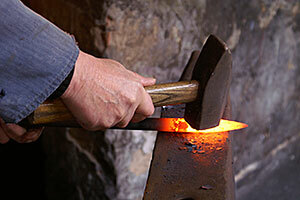 Learn the basics of forging and shaping metal on an anvil. Learn to mix paint properly for pouring and make a flip cup dirty pour. 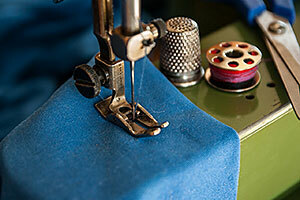 Learn the basics of using a sewing machine. Check out a full list of our workshops here or visit our Workshops page for a calendar of all our scheduled events Tip; click the drop down Event Categories list to search for a specific workshop. Check out all our Videos here.